Dead or Alive is a video slot game presented by NetEnt software platform. This is 5 reels and 9 Paylines slot game which offers a huge jackpot i.e. 2000 times of your total bet. The return of the player percentage of the game is 96.8 %, which shows the credibility of this game. You can play the game from 9p a spin to £18 a spin. There are six different options/features available in the game to go with. A player will have to select Bet level, Bet line and Coins value before playing the game. “Bet Level” is used to choose the preferred bet level, “Bet Line” is used to modify the number of active paylines and ‘Coin Value” option is used to regulate the coin size. Just like this “Spin” button is used when a player wants to play the game by hitting reels in motion, “max bet” is another option available in this game which is used when a player wants to play the game for the maximum amount and “Auto” is the option which is used when you need to spin the reels a number of times without any problem. 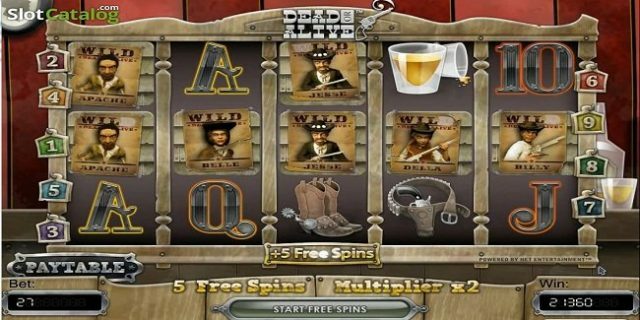 You can play the game dead or Alive for free or with the help of real money at Net Entertainment casino sites. The game includes cowboy hats, guns and hard liquor. The scatter symbol of the game is a Pair of Pistols. If you hit 3 or more scatters at a time on the reels, you will trigger 12 free spins. During these free spin feature, you can additional 5 free spins if getting 1 or more sticky wilds.